A long seven days at Cannes is drawing to a close with a bold bid to get the whole marketing industry together for the common good - PR should do the same if it wants to win more Lions. Another packed week in Cannes ended on a note of irony with all six major marketing services holding companies coming together to support the UN’s 17 Sustainable Development Goals just as the UK deciding to pull out of the European Union. It was an ironic juxtaposition to say the least. Talk of "putting aside differences" and "setting a powerful example to follow" contrasted with the isolationism and division opted for by the British people. The holding groups will work collaboratively across parent companies to promote the goals around economic growth, social inclusion, and environmental protection to try to end poverty, reduce inequality, and tackle climate change by 2030. They will also encourage other industries to follow suit. They will also provide cash for each of the six winning Young Lions campaigns - this year focused on the development goals - to be developed. 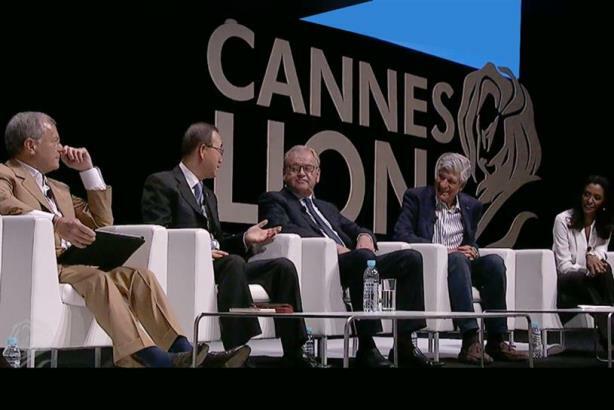 Five of the six CEOs took to the stage in Cannes Friday lunchtime – yes, even Martin Sorrell and Maurice Levy – with UN Secretary General Ban-ki Moon to launch the initiative. Dentsu’s Tadashi Ishii joined via video. As always with these initiatives, the proof will be in the pudding, but I say well done to the industry for setting an example and trying to do something positive to bring change to what is an increasingly crazy and mixed up world. You can find out more about the thinking behind the Common Ground initiative in our interview with WPP CEO Martin Sorrell, who also opines on Brexit and PR’s performance at the Cannes festival. As has already been covered widely, there was a lot of dissatisfaction among the PR pros in attendance at the festival about the lack of PR presence in the winning campaigns – only five agencies credited from 84 PR Lions. The flip side of this coin is that PR represented in several other categories, including Outdoor, Media, Mobile, Health, and Pharma – and there may still be more to come. Marketing communications is starting to resemble a soup within which all the PESO elements of paid, earned, shared, and owned coexist. It’s much more difficult to determine what PR, advertising, media, digital and so on actually are, which means the same campaigns tend to be entered across multiple categories and win multiple awards. The Cannes organizers aren’t going to reduce the number of categories anytime soon – they had a record 43,000 entries this year and that number will only rise. So PR firms have to learn to compete head to head with the ad firms. There was much bemusement among the U.S. contingent over why Edelman’s work on REI didn’t win a Gold Lion. But in a session I moderated for ICCO in its House of PR cabana, PR Lions jurors Erin Gentry from Hill+Knowlton and Valerie Pinto from Weber Shandwick explained that the entry didn’t sufficiently place the Black Friday campaign in a context that the jurors from all around the world could understand. Many of them had no idea what Black Friday is, so the impact of the campaign was somewhat lost in translation from the start. It’s a timely warning of the need for agencies to place their work in a proper cultural context that everyone can understand. The chair of the jury, John Clinton, was also restricted in the guidance he could give his fellow jurors on this one as he works for Edelman and would have had to recuse himself from discussions. CEO Richard Edelman was not happy with the outcome of the PR Lions, but actually his agency did pretty well, especially compared to some other firms. The biggest winner was Weber Shandwick, however, especially through its Swedish creative subsidiary Prime, which had a heritage of winning at Cannes long before it became part of Interpublic Group. And the Grand Prix went to Forsman & Bodenfors, another Swedish agency, so the Scandinavians are certainly doing something right in their approach to creativity and big ideas. For at least the second year running, no Gold Lions were awarded in the Crisis Communications and Media Relations categories. In the case of the former, it is understandable that some of the best work doesn’t fit with the Cannes environment. Much crisis work is in the background and, by definition, can’t be talked about. But we know from the PRWeek Awards there is still scope to reward great work such as Busrson-Marsteller’s input to the Ebola crisis at Texas Health Presbyterian Hospital in Dallas last year. Cannes is much more about marketing and brand promotion. The case for the continued lack of recognition given to media relations is more of a mystery. It may be unfashionable to talk about it, and when I visit agencies these days their first reflex is always to talk about integration, content, paid media, and other exciting areas that PR has got into, with the end proviso that "media relations is still really important to us." And of course it is. It has certainly evolved and embraced social platforms and word of mouth, but media relations is still incredibly powerful. It’s almost as if agencies are shying away from the category because they are slightly embarrassed to associate themselves with it and define themselves that way. If this is the case, I would urge PR firms to reconsider this strategy and double down on the category. There are Cannes Lions up for grabs, after all. This year, the Cannes organization also changed the definition of PR in some strange ways. "The definition of PR for the purpose of Cannes Lions is the creative use of reputation management by the building and preservation of trust and understanding between individuals, businesses or organizations and their publics/audiences. PR Lions will be awarded to the freshest creative PR campaigns, programs and tactics that actively engage consumers/audiences to products/brands/organizations and demonstrate the highest levels of strategic planning, creativity and business results." "The PR Lions celebrate the creative use of reputation. Entries will need to demonstrate innovative ideas that have sway; that is work that tangibly builds trust or engenders increased understanding between brands/organizations and their publics. (A number of criteria will be considered during judging and weighted as follows: 20% idea; 30% strategy; 20% execution; 30% results.)" Is the new abbreviated definition of PR too vague to allow for clarity and consensus in a jury room around how to evaluate its contribution to the success of the idea/work, especially a roomful of jurors from many nationalities? What exactly does "creative use of reputation" mean? And what is "sway"? Shouldn’t the phrase earned media exist somewhere in the definition, even if only as part of an integrated offer? Many entries still quote advertising value equivalency as a metric – the entry form should actively discourage this? And, finally, should entries be required to disclose budgets? The entry form no longer automatically assumes the entrant will be an advertising agency as it has in the past. The new forms are agnostic in terms of type of entrant in all divisions. This means a PR agency no longer has to list itself in the former "advertising agency box" to enter Direct, Promo, Outdoor, and so on. Quinn’s second big change in form, which is very important to PR companies to gain recognition at Cannes, is that entrants must disclose all partners, including the PR agency, if one was involved on the work. Previously, outside the PR category, there was no specific place to identify the PR agency on the work except as simply one of the many "contributing companies." Quinn believes these changes are helping PR companies gain recognition for their role on more of the work, whereas before it was easy to leave them out. Having said that, there were still a few examples of PR firms not getting their deserved credit and both FleishmanHillard and Weber Shandwick were among the firms that had to appeal to get their dues. Another gray area with this new system is that everyone’s claiming credit for "winning Lions" that may sometimes just be a credit. Ketchum had nearly a dozen shortlisted entries and/or wins at the time of writing this where it was the PR partner on the work, but wasn’t submitting it in that show division or category. Can they claim those as Lions? It’s still a gray area. And it’s difficult to define who had "the idea" anyway. I know the PR Council’s Renee Wilson is looking to coordinate a joined-up industry approach to the Cannes organizers to address some of the above issues. Agency leaders including Karen van Bergen, Richard Edelman, Stuart Smith, and Andy Polansky certainly seemed open to that idea. Olson even boycotted the Lions this year, because it doesn’t believe in the definitions of success being used, despite winning last year. As I’ve said before, there’s no point in navel-gazing about this or being negative – the industry needs to get together with Cannes and come up with a clear, logical, and fair system. As the six holding company leaders are hopefully about to prove on a macro level, working together is a much more effective way to go.